Halloween is just around the corner. I love getting the house ready for decorations and finding new ideas for them. And i love baking novelty things and coming up with ideas for them also. Here's some things i've done in preperation for the scary holiday! See previous posts for peanut butter spider cookies also. Baking is so much fun especially around holiday times. I posted some treats for Halloween previously. This week was last day of SCHOOL for Halloween; the kids got their mid term break yesterday. 60 cookies and some barnbrack managed to make it to school for their last day with fancy dress! 2. Roll out the pastry thinly and cut your shapes. I had Halloween cutters so I used the bat shape. 4. Halfway through I popped 2 chocolate chips (or similar) on each bat for eyes. In the evening I made the second batch. However I discovered I was out of eggs! 1. Mix 100g sugar with 200g butter until light and creamy. 2. Add in 300g flour & 1 tsp vanilla extract. With mixer on slow add in enough milk to bring the dough together. 3. On a flour board, bring the dough together and roughly knead it. Then flatten it out and roll out thinly. 4. Using your chosen cutter make your shapes and continue with above recipe from number 3. They worked a treat and i popped them in a sealed container easy to transport to school! So everyone recalls all the traditions around Halloween time. I remember simple costumes made from black bags; going around the houses trying to come up with a rhyme or a song; I remember the feeling walking into the houses and they were all dark, when you’d knock at the door and then a light would come on; I remember how excited we were; the games we played afterwards like the apple in the basin; how we’d all try our best to get the slice of barnbrack with the ring in it! So, I decided to try a twist on barnbrack. I will make a traditional brack for Halloween during the weekend as it requires soaking fruit. I did not have the fruit soaked so this is a recipe I whipped up. It’s tasty with some butter and a hot cuppa! 1. Combine 225g plain flour (I used gluten free flour here); 2 tsp baking powder; 125g dark soft sugar & ½ tsp mixed spice in a large mixing bowl. 2. Make a well in the centre and add 1 egg and stir it in with the end of a wooden spoon to combine. Then add a drop of whiskey and 100ml cold tea. 3. Finally stir through some sultanas until the mixture is really well combined. I used my food mixer to combine everything. You are looking for a wet mix dough. Don’t forget to add in a ring to the mix! 4. Pour the mix into a prepared (greased & lined) tin of choice and bake in a preheated 170°C oven for 1 hour. 5. When ready, cool slightly before removing from the tin and placing on wire rack. Remove any greaseproof paper now (to prevent it drying in to cake – it will be then impossible to remove it). 6. Once cooled I then cut my brack into mini loafs for my mini loaf cases but you can keep yours whole and cut as it’s needed. You can also cut into squares/bite sized slices and keep in a sealed container. Great with butter and a hot cuppa! This is a great tasting treat for Halloween with the mix of carrot; nutmeg; cinnamon and sultanas. And are simple to make. I made these for a cake sale. They were delicious if I do say so myself! My kind of cake! 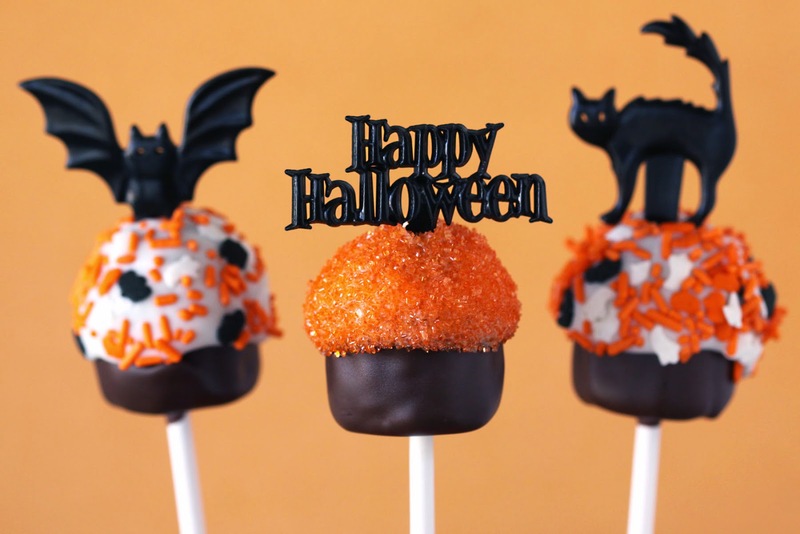 These are definitely on the Halloween menu next week in our house! 1. In a large bowl combine 200g brown sugar; 175g sultanas; 200g grated carrot (simply done if you have a grate attachment on a food processor) and grated rind of 2 oranges. 2. Beat together 5 eggs and 200ml sunflower oil and stir it into the carrot mixture. 3. In another mixing bowl sieve together 350g self raising flour; 1 tsp cinnamon; ½ tsp nutmeg and ½ tsp baking soda. Add in your carrot mix now and gently stir your mix well together. 5. Bake in preheated 150°C oven for approx 1 ¼ - 1 ½ hours. I test the cake by pressing down on the top. The top should spring back and be golden brown. To be certain I insert a skewer. If it comes out clean your cake is ready. 6. Leave in the tin for 15 minutes and then transfer to a wire tray to cool completely. 7. I then cut the cake into big squares to fit mini square loaf cases. 1. In a mixer beat 100g softened butter until it’s really soft. Add 300g soft cheese and mix until combined. 2. Add 100g sifted icing sugar and 1 tsp vanilla extract. Mix on high for about 4 3-4 minutes until smooth. 3. Using a palette knife swirl your frosting onto your carrot cake/squares and swirl the top. Add Halloween sprinkles for effect. This is when all your stocked up spices come in handy. I bought in some spices last Christmas and have used some of them during the year. But if you don’t at least you have them now for your Halloween and Christmas baking again. Hope you all enjoy preparing for this great Halloween holiday time. Is it going to be Trick or Treat for you?